Are the World's Biggest Building Blocks Prehistoric? In 27 BC, the Roman Emperor Augustus supposedly took the unfathomable decision to build in the middle of nowhere the grandest and mightiest temple of antiquity, the Temple of Jupiter, whose platform, and big courtyard are retained by three walls containing twenty-seven limestone blocks, unequaled in size anywhere in the world, as they all weigh in excess of 300 metric tons. Three of the blocks, however, weigh more than 800 tons each. This block trio is world-renowned as the "Trilithon". If we think within the official academic framework of history, Augustus had no obvious reasons for selecting Baalbek as the temple's building site. Supposedly, Baalbek was just a small city on a trading route to Damascus through the Bekaa valley in Lebanese mountains, about sixty kilometers from the Mediterranean coast (34º lat., 36º long.) It was of no special religious significance, apart from being in the centre of a burial region, in the midst of thousands of rock cut tombs. But, lavishing great architecture on Baalbek then seems totally out of character for the undeniably selfish Rome, which had at the very same time been stealing historic treasures from other countries, such as the obelisks from Egypt. It makes more sense that Baalbek had something no other place could offer, not even the city of Rome, the heart of the empire. This something may also be the reason why so many people wished to be buried there. Indeed, it has been noted that the blocks in the retaining wall of the Baalbek temple site clearly look a lot more eroded than the bona fide Roman ruins of the Temple of Jupiter, as well as those of the other two Roman temples also on the site. Therefore, the heavily eroded blocks should be much older. Bonfils, ca. 1870. Negative inscribed "468. Mur Cyclopeen a Balbek." Albumen. Unmounted. © 1996 Middle East Section. This fact naturally gives rise to a different scenario: At Baalbek Rome had found a fabulous ready made foundation, a mighty platform to add a suitably majestic structure to, stamping the Roman eagle upon the whole for the perception of future generations. The much greater erosion of the big Baalbek blocks qualifies as material proof of their much greater age. The issue really seems rather simple. This is how the stone looks when it is almost like new after having been recently sanded. However, sanding did not get rid of the deep pits, signs of either considerable previous erosion, or the product of drilling, if not both. a) Absence of Baalbek records. Above all, Rome records no claim to the incredible retaining wall. b) Presence of other records of actual Roman transport capabilities. Elsewhere in the Roman empire, just a little over 300 metric tons seemed to be the limit for the transport of big blocks, achievable only with the greatest difficulty. Transport of the 323 ton Laterano obelisk to Rome spanned the reigns of three emperors. Clearly, the record setting engineers from Baalbek, had they existed, could have also managed the task of transporting the relatively light Lateran Obelisk. The fact that they were nowhere to be found, no matter, how crucial the task, indicates that they simply did not exist. c) Baalbek was an important holy place. The Ptolemys conferred the title of Heliopolis upon Baalbek. Therefore, like the other Heliopolis (Sun City) under Ptolemys' domain in Egypt, it had to be an ancient holy place, it must have had some notable architecture, and the two places had to have some connection. I suggest it was the titanic blocks that instilled awe in everybody. 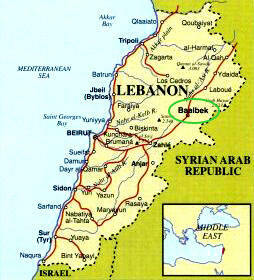 In Phoenician times, Baalbek had supposedly been a religious centre devoted to Baal. Local Arab legends place the cyclopean walls (the Baalbek Terrace) into the time of Cain and Abel. d) Roman and Megalithic styles of building. Orthodox scholars of today scoff at all suggestions that Romans had not brought the great blocks to the temple site, despite the fact that building with megalithic blocks was not at all in the Roman style, and was no longer practiced in those days. Romans knew and used concrete. The Colosseum still standing in Rome is a good example of a classic Roman concrete structure. The sad truth is that regarding the Trilithon, some scholars have mental blocks its own size. Admissions that blocks weighing over a 1000 metric tons were quarried and transported in prehistoric times would invite uncomfortable questions on what technology had made it all possible. Regardless of such touchy issues, I have several personal observations, which support dating of Baalbek's megalithic walls to the megalithic era. Have a look at this nice northwestern view of the wall (right image) as it was circa 1870. One forms the bulk of the wall, five layers of considerably eroded blocks. Several such blocks also survive in the sixth layer. Sizes of these blocks vary from big to unbelievably big, the largest building blocks anywhere. The Arabs had a fortress here. It was devastated by wars and finally by a major earthquake several centuries ago. The Romans must have left the old sacred enclosure walls as they were, and concentrated on building the temples. They had no need for defensive walls like the Arabs. The top corner of the northern block of the Trilithon is well rounded by erosion, and human abrasion. One of the newer, small blocks rests directly on this eroded, round spot. So, when it was lain into this position, the damage was much like it is today. If the big blocks were to be Roman, then the newer Arab blocks would mark the erosion of the older Roman blocks as it was after the first six or seven-hundred years. But, how could this erosion be a lot greater than the subsequent erosion of both the old and the new blocks in twice as much time? 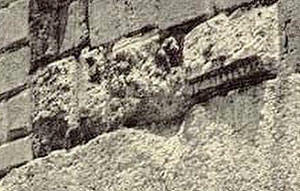 In the details below, we can see that whoever had added the smaller blocks (presumably also limestone, and coming from the same quarry, the nearest one to the temple), had made adjustments for erosion in the old ruin, which are visible as steps, or notches in the elsewhere straight line of the newer blocks. The eroded blocks seem to have been hewn flat on top to facilitate the laying of additional blocks. A horizontal line was cut into the older block. It seems to continue the bottom line of the neighboring newer block quite exactly. The red line you see is there to show this fact. I believe that the cut line had marked the top portion of the older block, which was to be cut away, so that the newer blocks could be set level. Thankfully, the plan was not carried out for some reason. Consequently, we have a clear clue to what had happened here. Because the line in the eroded block survives about as well as the newer blocks, the two materials must be similarly durable. It then follows that by the apparent rate of aging, the heavily eroded blocks should be at least several millenia older than the newer blocks. 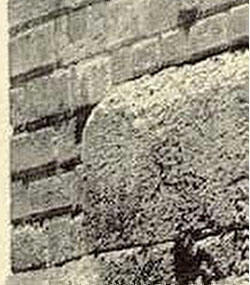 Ergo, the older part of the wall cannot be Roman. In a quarry about half a mile away from the Trilithon is an even bigger block It measures 69 x 16 x 13 feet, ten inches, and weighs about 1,170 metric tons. There is a belief, the block was slated for the retaining wall, but was later found to be too big. Thus, it was abandoned in the quarry while still joined to the bedrock at one end. The important question is, was it younger, or was it older than the three Trilithon blocks? It seems that it had to be made later than the Trilithon. If it was made first, and then deemed to be too big, it would have still been utilized, rather than quarrying a new block, the Romans would have simply whittled the big block down to a more manageable size. We would not see it in the quarry today. On the other hand, despite their brilliant ability to move about burdens as unprecedented as the Trilithon, the unknown architects lost their nerve at the very end, the big block looming almost ready. There was no attempt to move the practically finished block. This just does not behoove the solid Roman engineers, especially the creme de la creme entrusted with the task by the Emperor himself. Why did they leave behind a monument to their engineering limits and human weaknesses, and by extrapolation - Roman emperor's limitations? Again, this would be very un-Roman of them, and even more so in view of what the same engineers saw at Aswan. It is a fact that the big block still in a Baalbek quarry seems to weigh about the same as the famous abandoned obelisk at Aswan, Egypt. Here, the question begs itself if this really is by chance. How could the two biggest ever blocks of quarried stone coincide in weight, despite being made in different eras, by different techniques, and abandoned for different reasons? Not likely, is it? This thread gets funnier, when we learn that the fifty-four enormous columns for the Jupiter's temple actually came from Aswan! There the Roman engineers could not have missed witnessing the abandoned 1,170 ton obelisk, which the Egyptians had obviously intended to move, prior to discovering that it was cracked, a fatal flaw. Did the obelisk somehow inspire Romans to quarry a block of the same weight (albeit not proportion) at Baalbek, and then abandon it, when almost complete, mimicking the Egyptians ad absurdum, every inch of the way? Monkey see, monkey do? Is this not insane? Then there is that utter lack of documentation for these stunning exploits, which should have been proudly noted by Roman historians, politicians, and so on. It's a little like if American history books skipped the fact that America went to the Moon. Meanwhile, local legends ascribe the stones to the time of Genesis. The big blocks were part of a fortress built there by Cain. So, did Romans move the Trilithon blocks? Absolutely not! Romans had no desire to move such weights, because they knew just as well as we do that they could not move even substantially smaller blocks. History supports our notion with solid evidence from the same time period. When Augustus, emperor of Rome had conquered the region in 27 BC, he ordered that the massive obelisk towering above others at the Karnak temple in Egypt be brought to Rome, but the effort was aborted, when the trophy proved too heavy. Sources give varying estimates of its weight, from 323 tons to 455 tons. The discrepancy must stem from the fact that the original obelisk was 36 meters long, and had weighed 455 tons. Now that it is 4 meters shorter at the base, it must be correspondingly lighter, and because obelisks are always considerably thicker at the base than higher up, the loss of a hundred tons would be realistic. So, the discrepancy is self-explanatory. It seems to suggest a reason to why some 300 years later, Emperor Constantine I (reigned A.D. 306-337) had succeeded where Augustus had failed, namely, in taking the obelisk out of Egypt. But, in the process, the pedestal and a large part of its base were destroyed. Well, since we are talking about the otherwise indestructible Aswan granite, we have to deem the obliteration of the thickest, strongest part of the obelisk deliberate. "The decision to import the structure was taken by Constantine himself. Rome had at a dozen obelisks. His city, Constantinople or the "New Rome" had to have at least one. The Byzantines succeeded in fetching the monument from Deir el Bahri near Thebes, although in a sawn-off form. The original shaft was probably a great deal longer. Yet having brought it to the harbor on the Sea of Marmara side of the city, no one could figure out for an entire century how to get it up the hill"
Knowing all these facts then bears heavily on our judgment of what the Roman could, or could not do at Baalbek. a) Roman engineers had failed to even budge the 455 ton Thutmoses' obelisk at Karnak for emperor Augustus. b) But, allegedly, the same Roman engineers had successfully transported the three Trilithon blocks weighing twice as much, plus, twenty-four more blocks weighing pretty well as much, i.e., 300 - 400 tons, all of which we see in the enclosure wall of the Baalbek temple terrace. Unable to move the 455 ton Karnak obelisk, Augustus took two other obelisks from the Sun Temple in Heliopolis, instead. It was the first transport of obelisks to Rome. The obelisks are now in the Piazza del Popolo (235 tons), and the Piazza di Montecitorio (230 tons). Funny, 235 + 230 = 465. So, Augustus got his 455 tons, plus change, but it was in two parts. These are solid indications of the then Roman capacity in moving heavy objects. Why did Romans pick the remote Baalbek? Did they do it for practical reasons, utilizing older structures, and perhaps plentiful building materials already onsite? Even the fifty-four enormous yet typically Roman columns from Aswan granite, which had once surrounded the courtyard, of which six are still standing (image left), may be pre-Roman, but later recarved in the Roman style. Despite being as magnificent as they are, the spectacular and unprecedented construction achievements at Baalbek were not heralded to the world as its own by the proud and glory hungry Rome. Why not? Making such a claim would have been impossible, if the world already knew about the awesome Baalbek ruins, of course. If Roman and other writers had failed to mention the great Baalbek blocks, they were in amazing sync with the modern day's attitude.